Abuja — A wave of increasingly sophisticated militant attacks in northeastern Nigeria has forced almost 60,000 people to flee since November, the largest number for more than two years, raising fears from the UN and aid groups of a renewed Boko Haram crisis. Since Boko Haram's insurgency began in 2009, at least 35,000 people have been killed. Attacks across the wider Lake Chad region – which encompasses parts of Cameroon, Chad, Niger, and Nigeria – have seen some 2.5 million people displaced, including 1.9 million internally in Nigeria and some 250,000 Nigerian refugees. Although the Nigerian government has regularly made claims that the jihadist threat has been minimised, evidence on the ground suggests otherwise, and there are concerns that Nigeria's general elections on 16 February may make the situation worse. About a week later, another 35,000 people fled Rann for Cameroon, fearing another militant attack. Most now reside in a makeshift settlement in the Cameroonian village of Goura, UN News reported, saying the refugees are safe and haven't – for now – been asked to leave. On 28 January, Rann residents' worst fears were confirmed when at least 60 people were killed in the deadliest attack yet on the town by Boko Haram, who also destroyed hundreds of shelters for displaced people. The UN's refugee agency, UNHCR, expressed immediate alarm, saying it was "gravely concerned" about the safety and living conditions of people who were returned last month. "This action was totally unexpected and puts lives of thousands of refugees at risk," said UN High Commissioner for Refugees Filippo Grandi. Speaking to IRIN in Cameroon last week, UNHCR's Assistant High Commissioner for Protection Volker Türk was more diplomatic. "When a country receives 35,000 people just in a couple of days, you would have a big crisis in the country," he said. "Sometimes the situations are very difficult, but it is very important for us to find the bridge between the true security interests of a country and the protection of civilians." Cameroon fears infiltration by Boko Haram, who have mounted scores of attacks since 2014 in the country's Far North Region – typically suicide bombings. Cameroon's military has recently reported a resurgence in Boko Haram activity along its border with Nigeria and said there were five attacks in the region in January alone. "The situation in the northeast [of Nigeria] remains volatile and forced return is exposing these people to harm," said Idayat Hassan, director of the Abuja-based Centre for Democracy and Development, a policy and advocacy think-tank covering West Africa. 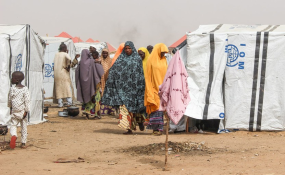 Across Nigeria's northeastern Borno State and in neighbouring countries, existing camp facilities are overstretched. Having thousands flock to the same locations leaves people in dire need of shelter, food, and water, and can lead to unsanitary conditions and greater risk of disease outbreaks, Hassan told IRIN. Because of the "spike in attacks" and displacements in Borno State since November, NRC expressed concern about the resulting humanitarian crisis. "More than 100,000 people have been forced to flee, many for the second time," Eric Batonon, Nigeria director for NRC, said in a statement. "By denying assistance and protection to those fleeing, needs are exacerbated." In Cameroon's Bodo, MSF said it was assisting new arrivals with food, water, and medical care. In Goura, the UN and its partners responded to the sudden influx by providing basic services, including shelter and protection, in the makeshift settlement. UNHCR's Türk said the priority was to "save the life of everybody who was able to escape". "I have personally met Nigerian refugees in Cameroon," he said. "Those people are traumatised. Things are happening in a very complex security context. So what we are trying to do is to marry the protection of people whose lives need to be saved... and identification of security needs that are legitimate." Türk said while immediate emergency assistance is the main focus, it's also essential to support vulnerable host communities and refugees who have been in camps for a long time – assisting them with access to education, health facilities, and social protection. "Generally, there has been an upsurge in direct military confrontations since mid-2018, around the same time there was a leadership change within ISWAP," explained Omar S. Mahmood, a senior researcher at the Institute for Security Studies, or ISS. "Since then, the group has been on the offensive, pushing back military units across much of northern Borno." The Nigerian government is quick to downplay the potency of the militants, but renewed attacks on military outposts, aid workers, and civilians suggest they have grown more aggressive, and possibly also in number and strength. At least 100 soldiers have been killed since late December, according to a report seen by Reuters. IOM also noted the "increased sophistication" of the attackers. Matthew T. Page, a former US State Department official and associate fellow at the Chatham House think tank, said Nigeria's political and security leaders were unable or unwilling to devise a comprehensive counterinsurgency strategy. "Their piecemeal approach is not commensurate with the seriousness and complexity of the threat," he said. In a war where cooperation between neighbouring countries is essential, the forced return of refugees could also hinder the battle to stave off threats from jihadists. "Many times we only see the military activity and issues of insecurity," Türk said. "We should never forget that civilians are directly affected as they are caught in the crossfire, caught between the rock and the hard place when it comes to fighting and violence." UNHCR, which is coordinating the response plan, says recent violence has pushed people into "crowded camps or in towns in Borno State where they are surviving in tough living conditions". "When President Muhammadu Buhari was first elected in 2015, he prioritised the Boko Haram conflict and made substantial gains," he said. "Some of those have elapsed now, especially as the political season has taken over." Central to stemming any recent losses would be coordination with neighbours like Cameroon, Mahmood said, adding: "The insecurity clearly has regional implications and does not adhere to political boundaries."